Not only did he correct me, he wrote a corporate blog post about me with an accompanying dinosaur meme graphic he was so amused (I have replaced it with the graphic for an East London beer). The exec hadn't said Belton's Braces. He'd said Belt and Braces. Ah!!! That makes sense. 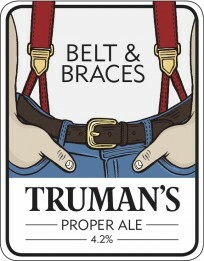 Although the allegation that we use Belt and Suspenders in the U.S. is dubious. I've never heard anyone use that particular phrase before. But the idea of wearing both a belt and braces as two layers of protection against your pants falling down - something Justin Bieber might do well to learn - as translates to a software project, making sure you implement a few options so as to be sure you won't fail. I grok that.